Julia Balassa-Myracle with her creations. Julia Balassa-Myracle has chocolate in her blood. Growing up Chiapas, Mexico, she remembers grinding and roasting cocoa beans by hand when she was a little girl. “I’ve been working with chocolate my whole life,” says Balassa-Myracle, owner and chocolatier of Chocolate Myracles in Spokane Valley. After six years of producing hand-rolled truffles and poured chocolates for the wholesale market, Balassa-Myracle recently moved into a much larger manufacturing facility that includes a classroom and small retail space in a commercial center just north of Pines Road. Time it right and you can buy some chocolates, sip some vino from neighboring Nodland Cellars and quaff some suds from Twelve String Brewing, located just two doors down. All of Chocolate Myracles’ chocolates are made with single-origin, fair-trade beans from South America, the birthplace of cacao. The Latin influence is evident in several of the chocolates, including a geodesic-dome-shaped truffle with Mexican cinnamon and the San Cristobal bar, with bits of crunchy cocoa nibs and caramelized chilis. Local ingredients also find their way into the chocolates, from Latah Creek’s huckleberry wine to Coeur d’Alene Cellars No. 6 red. The Port Truffle, Venezuelan dark chocolate flavored with Knipprath Cellars’ chocolate port and adorned with a 14-karat gold leaf, is pure decadence. “We’re developing a truffle with Nodland Cellars’ wine, too,” says Balassa-Myracle. Chocolates are available individually or in boxed sets. Prices range from $5.25 to $6.25 for 1.7-ounce chocolate bars, and $1.60 to $1.90 for individual chocolates. You can also pick up a package of miniature dark-chocolate cups just large enough for a sip of wine or dollop of chocolate mousse perfect for your next dinner party ($10 for 20). 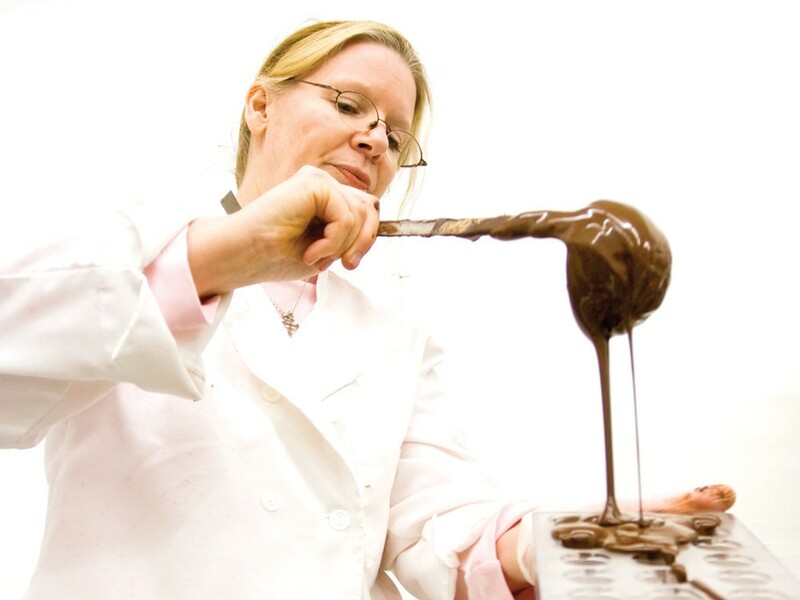 If you want to try your hand at making chocolate, cooking with it, or just eating some, in March Balassa- Myracle will be teaching classes on hand-rolled Irish cream truffles, chocolate tamales and wine truffles. Call the store for more information.